The new Ford Kuga Vignale and Ford Edge Vignale are the first sport utility vehicles (SUVs) introduced as part of the Ford Vignale upscale product and ownership experience – and meet growing consumer demand for more luxurious SUV models. 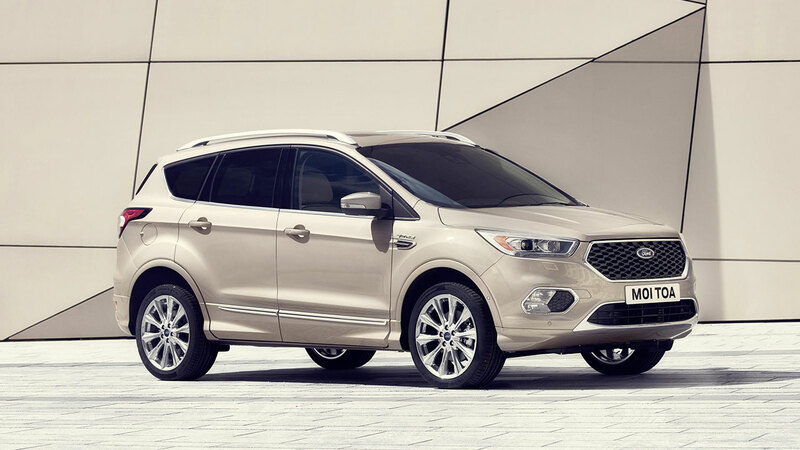 Both the Ford Kuga Vignale mid-size SUV and Ford Edge large SUV deliver exclusive specification and high-quality materials including tuxedo-stitched Windsor leather interiors, unique Vignale colours, and detailing including the signature Ford Vignale hexagonal grille design. 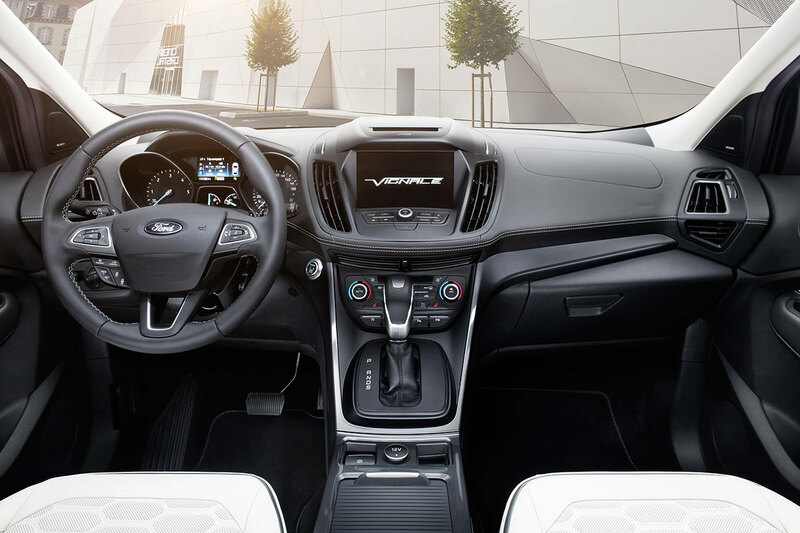 Cutting-edge technologies include Ford’s Adaptive Front Lighting System that adjusts the headlight beam angle and intensity to match the driving environment, and Ford’s SYNC 3 communication and entertainment system that delivers faster performance and an 8-inch touch screen that enables pinch and swipe gestures. Powerful, fuel-efficient and refined powertrains include Ford’s 210PS bi-turbo TDCi diesel for the Ford Edge Vignale, and 182PS 1.5-litre EcoBoost petrol engine for the Ford Kuga Vignale. 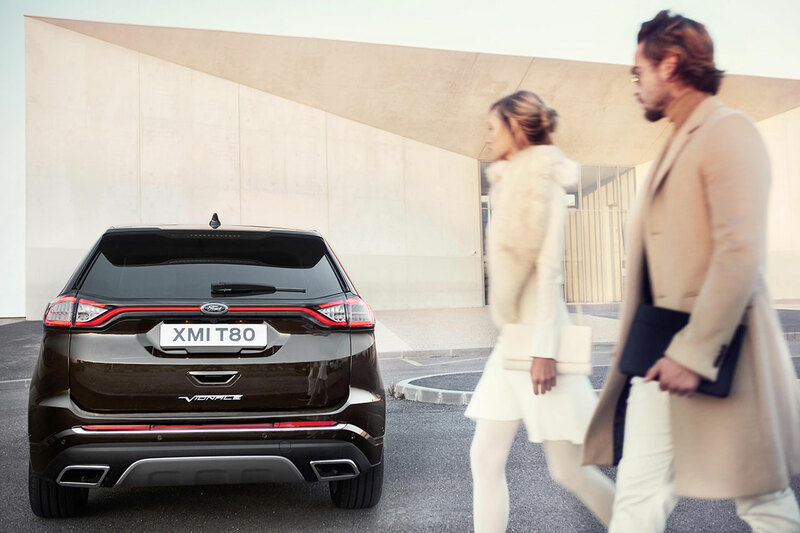 Ford Intelligent All Wheel Drive (AWD) is delivered as standard for the Ford Edge Vignale and is offered for the Ford Kuga Vignale, delivering a seamless transition of torque between all four wheels to provide a more secure footing on the road. 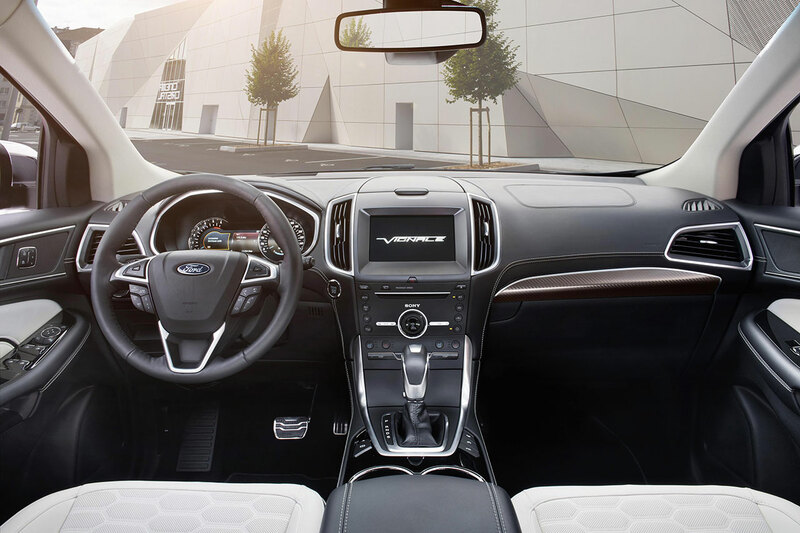 Refinement is further enhanced for the Ford Edge Vignale with Ford Active Noise Control, which directs opposing sound waves through the audio system to cancel out engine noise and improve cabin ambience. The percentage of SUVs sold in the UK in 2015 rose over 25 per cent to 642,194 compared with 2014 sales. Over 80 per cent of the 32,944 Kugas sold in 2015 were high-specification Titanium models, indicating high demand for luxury variants in the SUV segment. Based on the sophisticated new Ford Kuga, the Ford Kuga Vignale is offered in exclusive specifications including the unique Vignale pearlescent Milano Grigio exterior colour influenced by rose metallic tones. Further detailing includes dark gloss effect finishes for the front and rear skid plates, door appliques and boot trim. The signature Vignale hexagonal grille design features at the front. The upmarket character of the Ford Kuga Vignale interior is heightened with unique hexagonal-quilted Windsor leather featuring prominent tuxedo-style stitching for the seats and door interiors, offered in signature Cashmere colour. The upscale leather treatment also extends to the instrument panel. 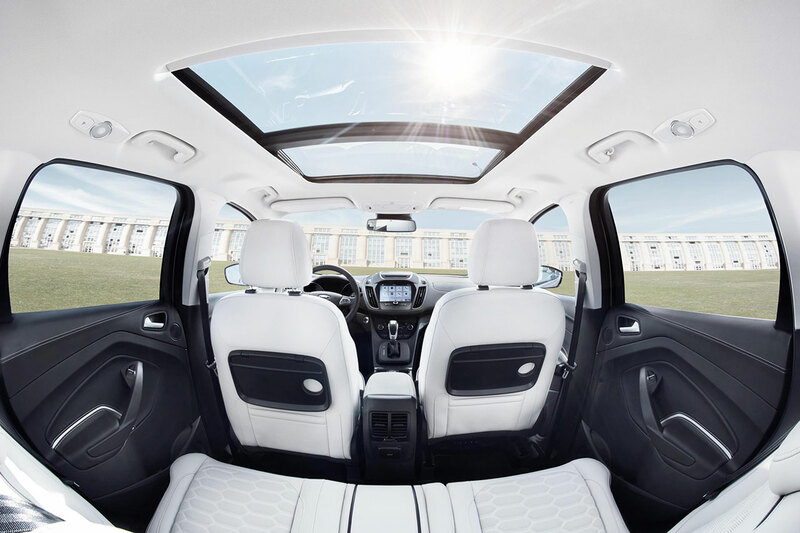 Advanced Ford Kuga Vignale technologies include Ford’s Perpendicular Parking that helps drivers park hands free in spaces alongside other cars; an enhanced version of the Active City Stop collision avoidance system; and Hands-Free Liftgate for simplified access to the luggage compartment. Ford’s Adaptive Front Lighting System adjusts the headlight beam angle and intensity to match the driving environment, including a Weather-Dependent Lighting mode that automatically adjusts headlights to help drivers spot roadside hazards in extreme heavy rain. 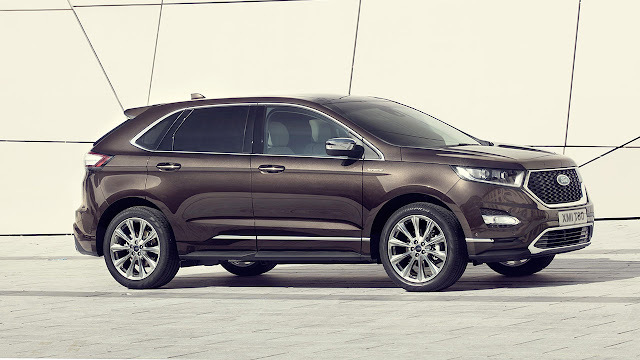 The stylish and contemporary Ford Edge Vignale features carefully executed exterior detailing for enhanced exclusivity, including bespoke chrome-finish fog lamps, signature Ford Vignale hexagonal upper grille design with dark matte finish and polished aluminium surround, and 19-inch polished aluminium wheels. Unique exterior colours include rich metallic brown Vignale Ametista Scura. 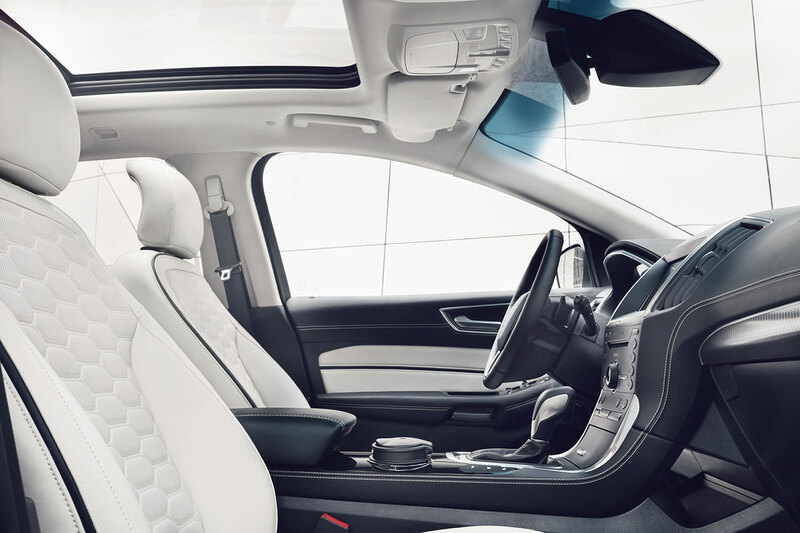 The refined interior delivers hexagonal-quilted Windsor leather featuring prominent tuxedo-style stitching for the seats and door interiors, offered in light Cashmere or dark Ebony colours. Leather extends to the central armrest and storage console, and to the instrument panel, which features a woven aluminium applique on the passenger side. Refinement is enhanced with Ford Active Noise Control,* which uses three microphones strategically placed throughout the cabin to monitor engine noise in the interior, and directs opposing sound waves through the audio system to cancel out engine noise and improve cabin ambience. Additional technologies designed to help reduce stress for drivers include Front Wide-View Camera–which can see around corners even when drivers cannot to potentially help avert collisions; Blind Spot Information System, Traffic Sign Recognition, Lane Keeping Alert, Lane Keeping Aid and Driver Alert. The Ford Edge Vignale is offered with two powerful diesel powertrains; 210PS bi-turbo 2.0-litre TDCi six-speed PowerShift AWD and 180PS 2.0-litre TDCi six-speed manual AWD. Both deliver 47.9mpg and 152g/km CO2. All Ford Vignale models deliver as standard the Ford’s SYNC 3 communication and entertainment system that delivers faster performance and features a redesigned 8‑inch touch screen enabling pinch and swipe gestures for the first time. Ford has drawn on more than 22,000 customer comments, and insights gained from research clinics and surveys to ensure the new version is the most user-friendly system to date. SYNC 3 delivers faster performance, simplified commands, and supports five additional languages. Simply by pushing a button and saying “I need a coffee,” “I need petrol,” and “I need to park,” drivers can locate nearby cafés, petrol stations or car parks, and find train stations, airports, and hotels. Drivers can operate SYNC 3’s 8-inch touchscreen in the same way that they use their smartphones. A new interface features larger, easier to operate buttons and enables pinch and swipe gestures for the first time. Ford’s Intelligent All Wheel Drive system delivers a seamless transition of torque between all four wheels to provide a more secure footing on the road especially in slippery conditions and can adjust torque delivery up to 50/50 between the front and rear wheels in under 20 milliseconds – twenty times quicker than it takes to blink. Each Ford Vignale vehicle is individually tailored to customer specification, and manufactured using a process that blends traditional craftsmanship with cutting-edge technology. The latest laser and camera technology supports the artisan’s trained eye in closely examining every aspect of a Vignale vehicle from bodyshell and panel alignment to paint finish. 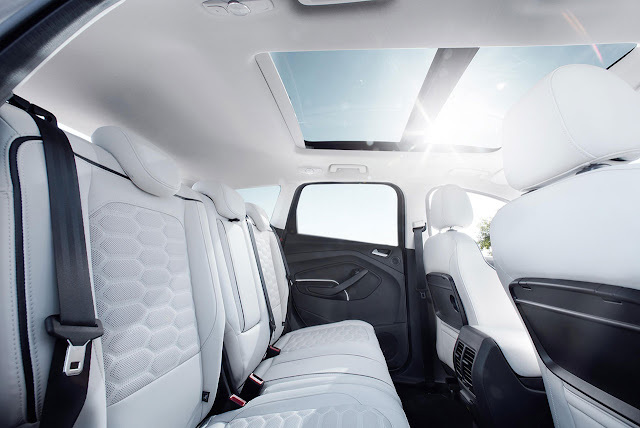 Passionate about precision and attention to detail, experts spend more than two hours hand‑polishing the paintwork to create the perfect high-gloss finish; and also carefully scrutinise thefine detailing and stitching of individual laser-cut pieces of leather trim fitted to each seat. Vignale models undergo 100 additional quality checks, and at Ford’s production facility in Valencia, Spain, ostrich feathers – each measuring up to 76 centimetres in length and weighing less than 3 grams – are used to remove tiny dust particles from the Ford Vignale bodywork immediately before painting, resulting in an even smoother finish. The new Ford Kuga Vignale and Ford Edge Vignale upscale sport utility vehicles expand the Ford Vignale portfolio to four models, following the introduction of the Ford Mondeo Vignale four-door and wagon in 2015, and Ford S-MAX Vignale seven-seat sports activity vehicle earlier this year. The Ford Vignale model range is available to order at FordStores across Europe, and at customers’ Ford retailer of choice. FordStores incorporate dedicated Vignale Lounges that deliver a personalised purchase experience supported by a Vignale Relationship Manager. Ford already has established 360 FordStores and expects to complete its roll-out of 400 early next year. Ford also offers a dedicated lifestyle service that helps Ford Vignale customers across Europe efficiently arrange travel, event and lifestyle activities. Delivered in partnership with Total Management – a global event, lifestyle and travel agency – the service offers a carefully selected collection of experiences to Ford Vignale customers. Additional customer benefits offered by Ford Vignale include the Vignale Service smartphone app for Apple and Android™ operating systems. The app delivers a direct link to online lifestyle content from the Vignale Magazine, in addition to offering driving tips and information; a dealership locator; and GPS-enabled services including Ford Vignale Park Me, fuel stations locator, and a one-touch connection with emergency services or Ford Vignale One Call. Customers can now use Ford’s new dedicated Ford Vignale Internet destination and online configurator to explore pricing and options – including the new design options introduced earlier this year that enable customers to further personalise the exterior styling of Ford Vignale models.